"Brazil is the country of the future - and always will be." "Brazil is the next great power - and always will be." The Brazilian Navy (MB) has been concentrating its efforts on the Strategic Project of "Construction of the Nucleus of Naval Power", which will result in the expansion of operational capacity. The Naval Defense Strategy defined two strategic priority areas in terms of the need to control access to Brazil: The maritime range from Santos to Vitória, where the main oil producing areas of Brazil are located and the mouth of the Amazon River. Thus, the Brazilian Political Power identified the necessity of two squadrons, each one nucleated by a Ship-Airfield. For these reasons and for the need to obtain the substitute for the "São Paulo" NAe, which should be withdrawn from the active service in 2039, in 2012 the Navy repared PRONAe. PRONAe contemplates the design and construction of two Aerial Vessels with an approximate displacement of 50,000 tons, equipped with two catapults to launch aircraft and stop cables to collect high-performance fixed-wing aircraft. Michael E. Connors wrote in 2005 that "The Brazilian Navy is unique among most world navies today. Since the end of the Cold War, most nations have reduced their naval power, yet Brazil has maintained a determination to possess a blue-water fleet. Brazil is also attempting to assert itself as the regional power in South America, in this case through the development of a modern yet modest naval force capable of projecting power beyond its shores.... First, Brazil is seeking possession of a blue water naval force as a likely means for it to achieve greater power and prestige amongst other powerful states in the world. Second, Brazil aspires for a permanent seat on the United Nations Security Council, and is expanding its fleet to increase its chances of being chosen. Finally, domestic politics also have a great effect on Brazil’s current drive to blue water." The Navy of Brazil has only one aircraft carrier, the São Paulo, built in France and commissioned the French Navy in 1963, was acquired by Brazil in 2000. The former French carrier Foch was transferred to Brazil November 2000. With approximately 32,000 tons displacement, the São Paulo can operate about 40 aircraft. The ship has two catapults, approximately 50 meters long, to launch aircraft up to 20 tons and an arrestor consisting of 4 cables for landing aircraft. The aircraft carrier is, currently undergoing an extensive Maintenance Period General (PMG) in AMRJ that will replace some systems and sensors, thus allowing it to return to work with AF-1 aircraft and future aircraft. Although rehabilitated, the ship a little tired by soon half a century of navigation. The aircraft carrier São Paulo will have its life extended by the year 2025, or be replaced. Brazil desires a multi-purpose Navy, able to operate in maritime areas far from its coastline, in defence of sovereignty and national interests. In addition to the waters under national jurisdiction (which make up the "Blue Amazon"), the Brazil-Africa maritime border and the access routes into the South Atlantic are strategic areas for the country. Brazil is among the nine countries in the world that have some kind of aircraft carrier [ship-aerodrome - NAe] capable of operating fixed-wing aircraft. In South America, only Brazil and Argentina owned ships of this class in the past. Today Brazil remains only the Navy, with the São Paulo. The medium naval powers employ their carriers in limited scenarios, in the performance of tasks of maritime area control and power projection on the ground (in support of amphibious operations of modest size). The US Navy, by contrast, employs his NAe nuclear-powered instruments for projection of power on a global scale. The Joint Plan for Marine Equipment of Brazil (O Plano de Articulação e Equipamento da Marinha do Brasil - PAEMB)), in line with the National Strategy of Defense (END - Estratégia Nacional de Defesa), sees that the Navy of Brazil (MB Marinha do Brasil) will incorporate a new ship-aerodrome [novo navio-aeródromo] from 2025, replacing the ship-Aerodrome São Paulo. The Joint Plan provides for obtaining two carriers capable of operating fixed-wing aircraft, within the time frame 2010-32. Of the two ships set out in the PAEMB, the MB should start building the first unit in 2015 and its incorporation will occur in 2025, replacing the aircraft carrier São Paulo. Also according to the PAEMB, the MB will acquire an initial batch of 24 aircraft units, replacing the A-4 Skyhawk. This plan also contemplates the prospect of obtaining four ships-assault helicopter airfield (NAeHA), within the timeframe 2012-28. This includes obtaining a total of 48 aircraft and high-performance attack (possibly a naval variant of the F-X 2). Also it is planned to obtain other 24 fixed-wing aircraft to support missions, as well as various types of helicopters. Following the standardization of policy implemented by the Ministry of Defense for the acquisition of military equipment, the MB follows closely the outcome of the FX-2 Program of the Brazilian air force, as the embedded version of the FX-2 aircraft would be ordered by MB on-board air wing to make his new ship-aerodrome. Studies were initiated for the construction of a new aircraft carrier that will replace the aircraft carrier São Paulo. The ships will displace about 40-60,000 tons and can have configuration CTOL (Conventional Takeoff and Landing) or STOBAR (Short Takeoff But Arrested Recovery), depending on the aircraft to be chosen. A second unit may be acquired in the future. Brazilians plan to build ships of this type, but more modern. It would likely be buildings with catapults and cable traps [in French: CATOBAR (Catapult Assisted Take Off Barrier Arrested Recovery)], a model that only implement the US Navy and the French Navy with the Charles de Gaulle. Brazil plans to build in its own shipyards two aircraft carriers to conventional propulsion, and solicit foreign industrialists for assistance. Clearly, aid for the development of plans for design and execution, as well as a very specific military naval construction engineering support. The future class of carriers for the Brazil Navy could be designed and built in the country – possibly in partnership with some shipyard or international projects Office. On 18 October 2011, the Brazilian Minister of defence Celso Amorim on a visit to Paris broached the subject, declaring that his country "beginning to think necessary to build an aircraft carrier. 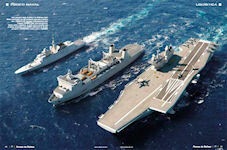 It will be an aircraft carrier which, ideally, will be built in Brazil, with some technologies import." In Paris, the information did not fallen into deaf ears and things have been somewhat clarified since. Government services and industry French DCNS, constructor of national military vessels, followed with great attention the Brazilian aircraft carrier intentions. France is already assisting the Brazil to build a hull of nuclear attack submarine that will be equipped with a system for the production of Atomic Energy of national design. It also sold to this country four attack conventional-powered submarines. In Paris, it was expected that a Brazilian decision would be forthcoming "within twelve to eighteen months", but this is Brazil. The budget issue on which the contract of combat aircraft had encountered is not seen as an obstacle to Paris, where it is said to be convinced that the strategic ambitions of Brasilia impose the continued modernization of its military. The French had not renounced to sell the Rafale to Brazil. According to the French Navy between April 1993 and February 1998, there were 168 catapult launches of the Rafale M F1 from Foche, before the ship was sold to Brazil. The French see new opportunities from the perspective of an endowment of this country in modern aircraft carriers. French industrial source, it is estimated that sailors have taken hold of the Brazilian defence. They understood that the Brazil wants to change dimension through an aircraft carrier. Restive with the purchase of the Rafale, the Air Force has not transferred to this policy. But the prospect of the staffing of the Navy in modern aircraft carriers could change the situation, as the Rafale has an embeddable naval version. It is also the case of the Boeing F-18, but not the Gripen NG, the third competitor committed in providing to the Brazil of a modern combat air force. The Navy expects the new fighters to be the same as the F-X-2 winner, which left Saab competing against two proven naval fighters: Boeing’s F/A-18E/F Super Hornet and Dassault’s Rafale-M. Saab has been working on the “Sea Gripen NG” since the May 2011 announcement. There is no doubt that the conversion of aircraft "born" in land-based aircraft to operate in the embedded environment is a complex task. In the history of military aviation, all attempts to have news were not as successful. The few projects "navalização" of Western land-based aircraft that managed to get out of paper and became reality consumed a tremendous amount of man-hours of engineering in reprojetos and changes during its operational life, and of course, a huge outlay of financial resources development, which even went so far as to make a few attempts. The SEPECAT Jaguar, the F-4 Phamtom and T-45 Goshawk are well-known examples. However, history also shows that the reciprocal is not true. Aircraft were initially designed for embedded use usually fulfill with excellence their missions when based ashore. F/A-18, A-4 Skyhawk and A-7 Corsair can be considered good examples.